For years I have tried the whole chore thing to no avail. I can get GG to clean the bathroom, minus the toilet, but quite frankly, her complaining makes me just want to take over that job. Little Dude? It's useless. At one time I thought it would be a good idea for him to clean the insides of the windows once a week. He loves spray bottles. Why not? Well, I ended up with streaky windows and wet furniture. Dusting? Pointless. I have too many breakable things that I would like to keep in one piece please. Vacuuming? Sometimes, but only under my incessant hovering supervision. My vacuum is just too darn expensive to let them treat it like a toy! But I think I finally found something. And I will let you in on my secret. How to get your kids to do the dishes. I told GG that she was old enough to do them and she could start after the holidays (last Monday). She jumped at the opportunity! And to my surprise, so did Little Dude! Of course, he wanted to help wash. Not only is there not enough room at the sink for 2 people, but I really didn't feel like mopping. So he dried the dishes instead. I told him I would put them away when he was done, but he kicked me out of my own kitchen! I have never ran out of my kitchen so fast! Even faster than when I fill that room with smoke whenever I make meatloaf! After GG washed everything and Little Dude dried and sorted the dishes, I put them away. And guess what? Last night they did them again! How long do you think this will keep up? Hopefully they will keep them up long enough for you to ship them to me. My kids are useless!! Good luck with that!! So far, we haven't really pushed chores...but when Buddy decides he wants an allowance, he'll have some chores he needs to complete. My 6 year old loves to do anything with the dishes. In fact, we've put a step stool in the kitchen so she can help me unload the dishwasher too - she can pretty much do it all, I just don't allow her to touch the knives yet haha! That is just amazing.. I hope to do that some day.. My little one helps take the stuff of the dishwasher.. I know you will get your shopping done.. I had to clean bathrooms when I lived at home. I couldn't go out on the weekends until they were done, and done right. My kids like to do some chores, and hate to do others, but I make them do some of them anyway! I had to let go of some control, even though it drives me crazy, like letting them fold clothes & put them away even though they do a sloppy job....I just take a deep breath & walk away! My guy is 5 and I was surprised to find he liked putting the utensils away after we run the dishwasher. He also makes his bed and cleans up his playroom. He's mentioned wanting an allowance, but for now I explained to him that doing these things was just a part of cooperating and being a part of our family. I'll let him shake me down for cash in another couple of years. Enjoy your day in the spotlight SITS'a. Just stopping by from SITS. I hope the dishes are still getting done. It is truly amazing what motivates the kids. Just the other day my son unloaded the dishwasher and loaded in the dirty dishes without being asked - that was amazing. I haven't seen it since, but was happy for that one. Well I don't want to burst your happy bubble, but it won't last. My girls are 14 & 20 and they wise up real fast...but enjoy it while it does last! that's so funny...it's the only thing mine like to do too! They are still to little to 'wash' them, P2 is but If I let P1 wash then you know 2 would want in on it. So they unload the dishwasher. I take out all the knives and anything heavy/glass and let them go to town. Happy SITS day! I have the same problem with my ten year old. Surprisingly, he likes to do the dishes too! Great post! Wow, that is awesome! I husband always jokes that the girls are going to start cutting the grass this summer (they are 3 and 1.5 years old). He can't wait until they can reach the handle bars. Congrats on your SITS day! Also, I love the colors and design of your site. Chores are always a struggle with kids. 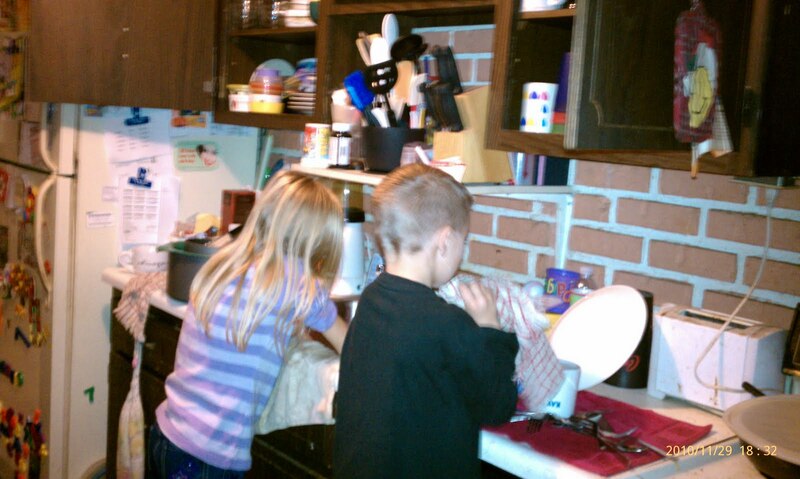 My solution is to make them "own" their chores. My 12yo owns the dishwasher & trashcan, so if dishes aren't emptied or trash isn't taken out, I know exactly where to point the finger. And he knows that no one will do them but him (unless he is sick or on a sleepover or something) so he just gets on with it. That sounds like a good chore to delegate. Once the novelty wears off, maybe it will become a routine and they'll do it without thinking about it. I like the idea. Awesome! Perhaps rotating chores, and keeping it "fresh" will help you avoid the "novelty wearing off" effect. It's such a brilliant moment as a parent, when things suddenly click with your kids, and they start to help out without pitching a fit! Awesome discovery! I hate makin' my kids do chores, too.